In the next seven years, the Bundeswehr will be replenished with new Leopard-2 tanks. Such optimistic headlines are blinding in the Western media. 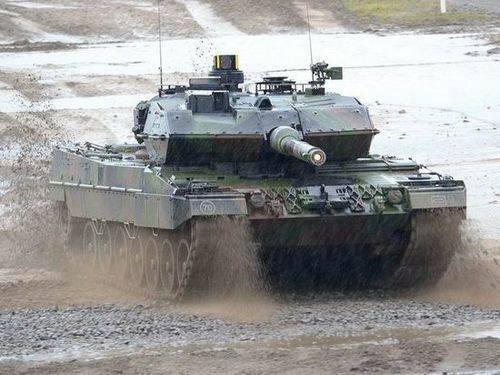 The Bundestag forked out at 25 million euros, so that the German army would finally receive more than a hundred brand new Leopard-2 tanks of the latest A7V modification. In addition, the financiers of official Berlin laid the same amount for the purchase of ammunition for the most powerful self-propelled artillery of the Bundeswehr – 155 mm PzH-2000. However, the expert told “MK” – one can hardly expect a big effect from such upgrades and purchases. In the Bundestag explain – the money allocated from the treasury should be enough until 2026. Exactly by this time it is planned to complete the program of tank modernization of Germany. What goes under the replacement? 101 tank “Leopard-2” of the previous modification A6M A2 and A6 must be replaced by a new A7V +. This updated has the best armor due to active protection and to the very tip of the trunk is stuffed with the latest electronics. But his main “trick” is a new trunk from the giant gunsmith Rheinmetall. It was he who, along with the new programmed DM11 projectile, according to the developers, should stop the “aggressive Russians” with their “Armata” and modernized T-90s. It is possible that the new “Leopards” will provide ammunition with a core of depleted uranium. It is noteworthy that a burning desire to resume the renewal of their “armor” appeared among the Germans in May 2015. It was then that Russia in Red Square demonstrated its newest tank, the T-14 Armata. The fight against Armadas “Armat”, inflamed in the inflamed imagination of the Germans, and became the main goal, which pushed the Bundeswehr to spend $ 25 billion. A number of experts believe that our modernized T-90MS Proryv and T-14 Armata are to blame for this hasty tank rearmament in the Bundeswehr. “The goal of this urgent rearmament is to somehow bring its“ armor ”in order,” armament specialist, military expert Alexei Leonkov says to “MK”. – Let me remind you that Germany once stopped the release of new tanks and even stopped upgrading the already released ones. When they rolled out the Armata, and later the modernized T-90, it turned out that the Bundeswehr had nothing to resist the new Russian models. And now they are in a hurry. “True, hundreds of even modernized, with new trunks, which for some reason the Western world dubbed“ the killer of Almaty ”, can even withstand the T-90, I’m not talking about the T-14“ Armata ”, – Leonkov summarizes. The expert emphasizes that there are no plans to hit, especially with the newest tanks that are still being run in, and have not. Now in the German hangars there are 225 Leopard tanks of various modifications, up to the age of 26 should be 320, respectively. In addition, with the consent of the Bundestag, German self-propelled artillery will be replenished with thirty thousand 155-millimeter shells for self-propelled guns PzH-2000.